Q: It is reported that the 71st session of the United Nations (UN) General Assembly recently adopted a resolution which incorporates the principle of "extensive consultation, joint contribution and shared benefits" put forward by China. What do you think is the significance of this? A: On September 11, the 71st session of the UN General Assembly adopted a resolution titled "the United Nations in global economic governance" under the theme of "Central role of the United Nations system in global governance". The resolution requires all relevant parties to improve global economic governance and strengthen the role of the UN in the principle of "extensive consultation, joint contribution and shared benefits". Meanwhile, it reaffirms that the UN should continue playing its central role, seek the common solutions to addressing global challenges and foster a community of shared future for mankind in the spirit of win-win cooperation. "Extensive consultation, joint contribution and shared benefits" is the guiding principle for the cooperation under the Belt and Road Initiative proposed by China and the important consensus reached by all relevant parties while advancing the Belt and Road Initiative. It has been widely applauded and actively received by the international community. In May this year, all relevant parties confirmed this principle during the Belt and Road Forum for International Cooperation. This principle emphasizes that all relevant parties should consult together, build together and benefit together and embodies the vision of equality, cooperation and win-win outcomes. Against the backdrop of the intertwining of the interests of all countries and the rising of all sorts of global challenges, the principle of "extensive consultation, joint contribution and shared benefits" is highly relevant. Previously, the resolutions adopted by the UN General Assembly and Security Council also contain such contents as the building of the Belt and Road Initiative and the vision of a community of shared future for mankind that are proposed by China. This demonstrates that the Chinese voices, Chinese proposals and Chinese wisdom are gaining understanding, support and responses from an increasing number of countries and are becoming the consensus of the international community. 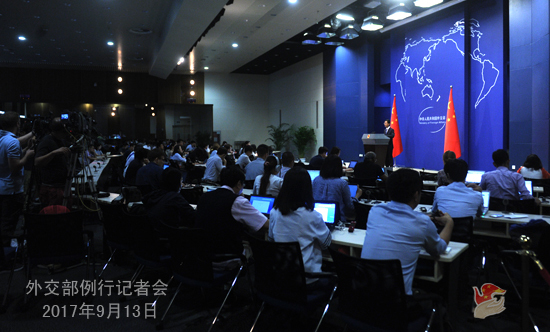 As a member of the emerging markets and developing countries, the Chinese side stands ready to join hands with the international community to follow the above-mentioned principles and visions to actively promote the reform of global governance system so as to make it better mirror the changes of the international landscape and better serve all countries around the world. Q: The Japanese Prime Minister is visiting India now and both sides are going to officially launch the first ever Japan-India high-speed railway project. What is China's comment on this? China and India also had several rounds of discussions on high-speed railway projects and the studies are still going on. Can you introduce the progress of the railway projects between China and India? A: We welcome the cooperation on infrastructure projects including the railway between the regional countries. We are also willing to work with the regional countries including India to promote exchanges and cooperation across the board and fuel regional economic growth. Regarding the China-India cooperation on railway which you are interested in, I want to say that railway cooperation constitutes an important part of the China-India pragmatic cooperation. The two sides have reached important consensus on carrying out railway cooperation. As far as I know, now the competent authorities of the two countries maintain communication on advancing cooperation in such areas as the high-speed railway and the acceleration of the existing lines. 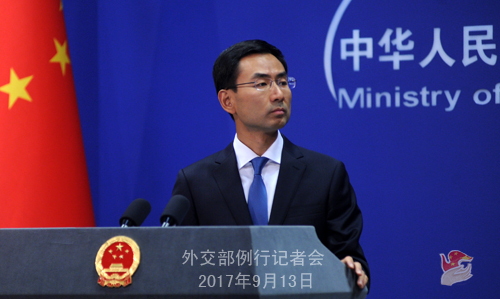 Q: It is reported that the US President Donald Trump will visit China in November. Can the Chinese side confirm this? A: On September 12, local time, after wrapping up his visit to Jamaica, State Councilor Yang Jiechi made a stopover in Washington D.C., the United States, during which he met with the US Secretary of State Rex Tillerson. 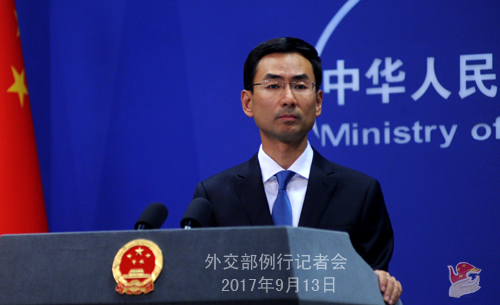 The Chinese side has issued the press release about the meeting. If you read it attentively, you can find the following sentences. I can repeat them. State Councilor Yang Jiechi said that at the invitation of President Xi Jinping, President Trump will pay a state visit to China this year and the Chinese side is willing to work with the United States to strive for the positive outcomes of this visit. Secretary of State Rex Tillerson also said that the US stands ready to step up communication and coordination with China to ensure that the visit of President Trump is fruitful. Q: According to the media of New Zealand, a Member of Parliament (MP) of New Zealand with a Chinese heritage has once been trained as a spy by the Chinese military. New Zealand's intelligence service is investigating this matter. Do you know anything about this? What is China's response to this? A: First, I would like to stress that the MP you mentioned is a citizen of New Zealand. So, as for the detailed information about him, I think you should ask the competent authorities of New Zealand. Second, with regard to the domestic affairs of other countries, we usually do not make comments. We follow the principle of non-interference in other countries' internal affairs. Third, we firmly oppose that certain media make up fake news by inventing groundless assumptions based on hearsay evidence and fabricating something out of thin air. Q: Last night, there was some rhetoric which could escalate the tensions on the Korean Peninsula from both the DPRK and the United States. What is your comment? A: We have made quite a few responses to similar questions. In brief, my response today is that we hope all relevant parties can remain rational, exercise restraint and refrain from taking the actions that could further heighten the tensions on the Korean Peninsula.